Everyone loves a good murder mystery. Time travel is a crowd-pleaser. And mods that don't just tweak a game but add hours and hours of new content? 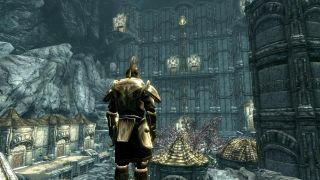 I'm talking about The Forgotten City, a Skyrim mod that's been in the works for several years but is now available, and features those tantalizing elements plus an original score and over a thousand lines of custom dialogue. You can watch the launch trailer above. The mod, created by Nick James Pearce, takes place in a sprawling underground city, one you'll need to explore to uncover its secrets. What's more, you'll need to explore it along multiple timelines as you travel through a time-warping portal in order to investigate a murder. Interrogate the city's inhabitants, learn their secrets, fight enemies, solve puzzles, and make choices that will have consequences on the story. Sprawling, ambitious mods like The Forgotten City can sometimes run into trouble when modders either don't provide custom voice work, or try to do it themselves. In this case, however, there's a cast of over a dozen actors from all around the world contributing their voices, so pull that arrow out of your knee and get adventuring. You're in good hands when it comes to the score as well, and you can listen to the original soundtrack, by composer Trent Moriarty, here on Soundcloud. Unfortunately, this is a rare Mod of the Week where I haven't personally played the mod I'm pushing on you. I'm currently plagued with PC hardware problems (it's been narrowed down to either to faulty memory or a dying hard drive). Still, we took an early look back in July and were impressed, and it definitely looks like one to try. The mod is designed for characters of level five or above, though the modder recommends you bring a high level character, as some of the story "responds to your character's individual history." He also recommends you don't bring a follower with you, as this is a solo adventure.